In this edition of ‘Industry Experts Q&A’, Martina Mistikova from Biz Latin Hub was welcomed in the offices of Sernatur, a governmental agency dedicated to the promotion of tourism in Chile to learn more about what the Chilean government does to enhance sustainable tourism in the nation. Biz Latin Hub (BLH): How would you characterize the sustainable tourism industry in Chile? Sernatur: The issue of sustainability in this country is expanding. Last year, Chile hosted the Global Council of Sustainable Tourism (GSTC) and brought together experts from the area of sustainable tourism from all over the world. Also, 2015 was declared as the year of sustainability by the World Tourism Organization. As a result, Chile has been working on different strategies, both public and private to address this topic, aiming to preserve the natural resources for which Chile is internationally known. Sernatur has created multiple policies which aim to enhance sustainable tourism as part of tourism in Chile. One example is the implementation of a nationally recognized certification- Seal of Quality and Seal of Sustainability. In 2007, Sernatur launched a project Seal of Quality as a form of differentiation between the companies engaged in the tourism in Chile. A twin project named Seal of Sustainability was launched in 2013 and incorporated the global standards of sustainable and renewable development for tourism businesses. At present, Sernatur has a record of more than 4,000 companies active in tourism. In the last five years, 272 companies have obtained tourism sustainability certifications. BLH: What opportunities are available for travel companies which decide to prioritize sustainable tourism over regular tourism? Sernatur: The main goal of Sernatur is to highlight the benefits of sustainable tourism to companies which are entering the market or are already active in the tourism sector. It is necessary to change the paradigm of thinking. The benefits of sustainable tourism are clear, but perhaps more in the long run. At a governmental level, many funds were created for companies who want to apply for the sustainable certification (Seal S or Seal Q). In addition, Sernatur offers a wide variety of benefits to businesses resulting from the creation of the Seal of Quality or the Seal of Sustainability. The companies with the certification S or Q are the first ones who receive any information about governmental funds to finance their activities, various projects or scholarships. Also, Sernatur prioritizes these companies in governmental campaigns and fairs. The certification serves as a great marketing tool because all companies are listed on the official Website of Sernatur. This enhances their credibility and distinguishes them from other companies on the local market. BLH: Are there any benefits available for foreign companies entering the sustainable tourism market? Sernatur: Foreign investors are more than welcome to apply for governmental funds, but they must have a local RUT (company) number. A foreign company must be either registered in Chile or have a Chilean representative in order to be eligible for the funds. BLH: What does the procedure to apply for Seal of Sustainability look like and what requirements the companies must fulfill in order to be eligible? Sernatur: It is important to understand that the entire process is voluntary. The companies must be enthusiastic about the issue of sustainability and must be interested in complying with the attributes of sustainable tourism. Firstly, Sernatur relies on a self-diagnosis system. The companies can download self-diagnostic material from the website, complete it and send it back to Sernatur. Secondly, Sernatur prepares a regional consultation, evaluating all aspects of the application. Thirdly, an authorized auditing firm visits the company and verifies the self-diagnosis result. Afterward, the independent auditing company informs Sernatur about the result which is presented to the National Tourist Sustainability Board. If some criteria are not fulfilled, Sernatur informs the company that they must adopt necessary measures or resend missing information. If all criteria are fulfilled, Sernatur issues the Seal of Sustainability and includes the company on its website of the certificated companies. BLH: How many companies have already applied for the Seal of Sustainability? Sernatur: At present, Sernatur has a record of more than 4,000 companies active in tourism. In the last five years, 272 companies have obtained this certification. The certification is granted for the period of two years after which it must be renewed. BLH: What have been the trends in the sustainable tourism market in recent years? Sernatur: It is important that sustainability is prioritized at all levels of government and in all the institutions, not just Sernatur. Following the Millennium Development Goals, Chile tried to ensure environmental stability by integrating renewable principles in all public areas such as infrastructure, transportation, housing or social policy. Only this year, Chile incorporated a new public transportation system designed to lower the level of CO2 emissions. These policies attract foreign direct investment which can be seen especially in the segment of infrastructure. As a result, investment in infrastructure has improved the connectivity of cities and has contributed to the growth of tourism. 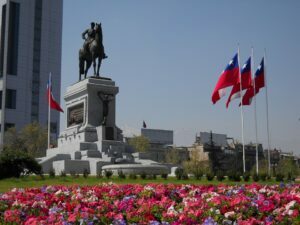 In addition, Chile launched a new initiative against Commercial Sexual Exploitation of Children and Adolescents (ESCNNA) within the framework of the new legal requirements for the certification of tourist accommodation. Thus, Sernatur organizes training and conferences to the providers of accommodation in Chile to combat and prevent any kind of such exploitation. At the same time, the world becomes more environmentally friendly and global travel increases. This combination creates a raft of opportunities for companies involved in sustainable tourism. Chile is both a leader in sustainable development and a popular tourist destination and local and foreign companies are taking advantage of the growth in interest relating to sustainable tourism. Biz Latin Hub can help you to achieve your commercial goals in Chile. Get in touch with a member of our team today via [email protected]. We are ready to support you and your business in Chile.